At the Adobe Learning Summit (Las Vegas - 24 October 2017) I was invited to present a session about the Timeline for advanced workflows. It is one of my favorite subjects (bit below my most preferred topic 'Advanced/Shared actions') because I see so many questions on the forum that are due to not or misunderstanding the Timeline functionality. For those users who were not able to attend ALS2017, I converted my Captivate presentation into a self-paced learning tutorial. 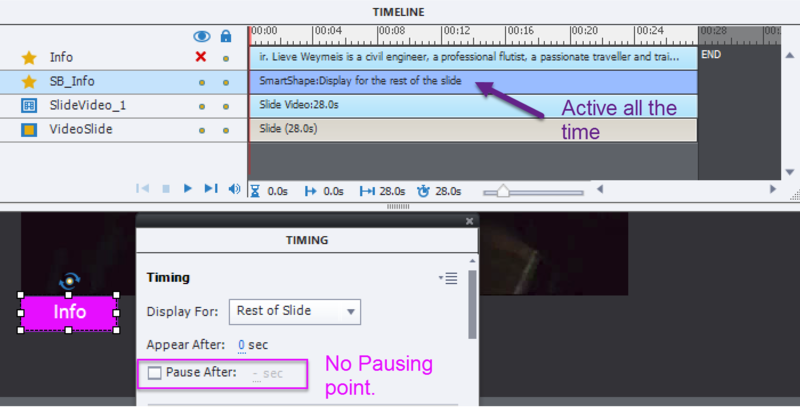 The tutorial has at its end links to different published movies, examples using the described features of the Timeline. 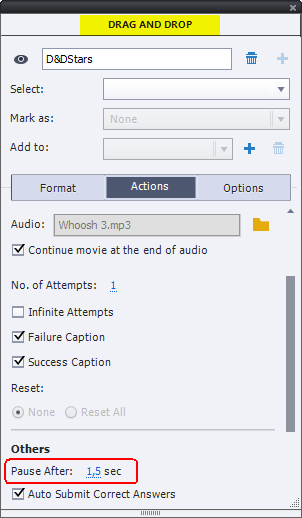 Several features are used in the movie itself: skipping audio on the dashboard (second slide) on later visits, Delay commands for automatically building lists on different slides. Be sure to use the circular button at the bottom to show the value of the system variable cpInfoCurrentFrame, to discover (some of) my secrets. I would appreciate feedback and welcome questions. Are you interested in learning more about the examples? 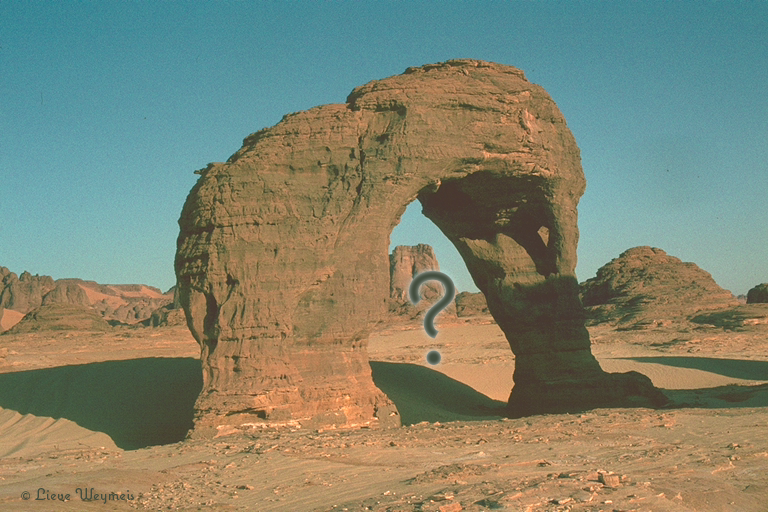 Are the mysteries not totally clear to you? Please let me know... If you want a copy of the handouts created for this presentation, send a mail to info@lilybiri.com. Title is not an nostalgic reference to the best spreadsheet application ever (Lotus 1-2-3) but is related to... Captivate. 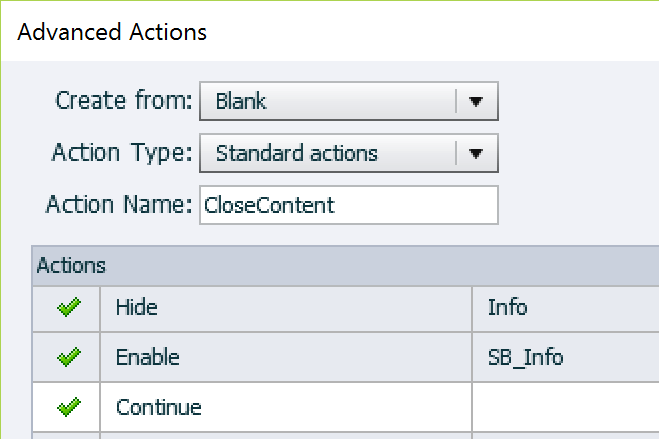 The THREE 'eye buttons' in Captivate are a source of confusion because they have exactly the same look (contrary to my image above) but show very different functionality. This button appears in the timeline panel in the first column, on top, next to the lock button. If you click the top button all objects on the stage are hidden. 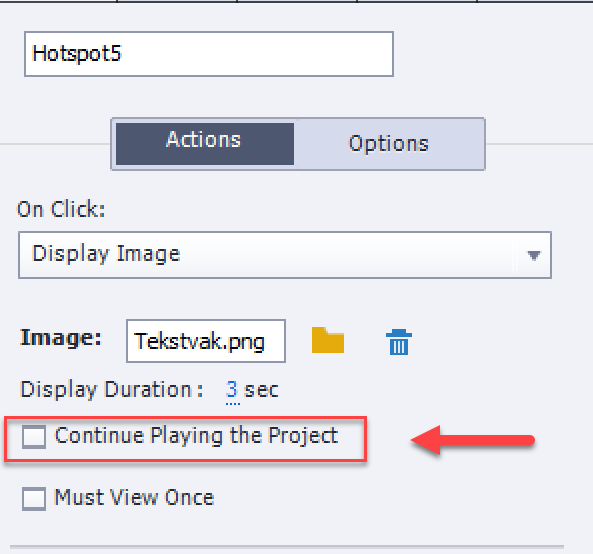 To hide individual objects, click a radiobutton left of the object timeiine. A red cross will appear (see screenshot below). 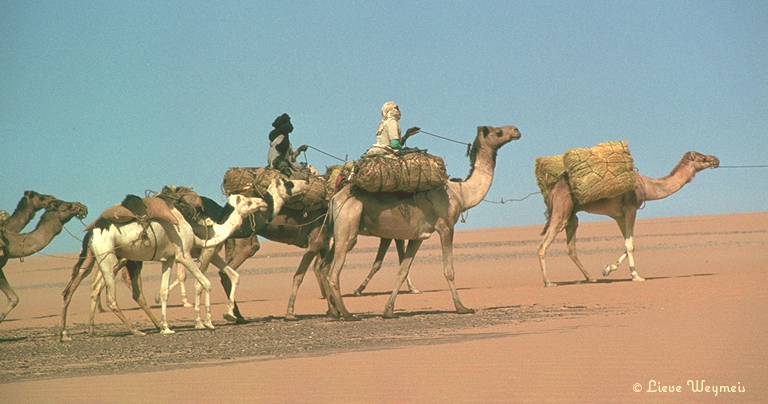 A full explanation of this and other timeline features and can be found in this article. Hiding an object on the stage has no effect whatsoever on the presence of that object when publishing (or previewing) the course: the object will be visible. What is the goal of this eye button? As you know (if you did read the article about the timeline), contrary to normal video timelines (included the Video Demo Timeline), a cptx slide will show all objects on the stage, whether they are scheduled to appear from the start or later on. That makes aligning a lot easier, but can also lead to a very crowded stage where objects are covering up other objects (except in the case of Fluid Boxes). 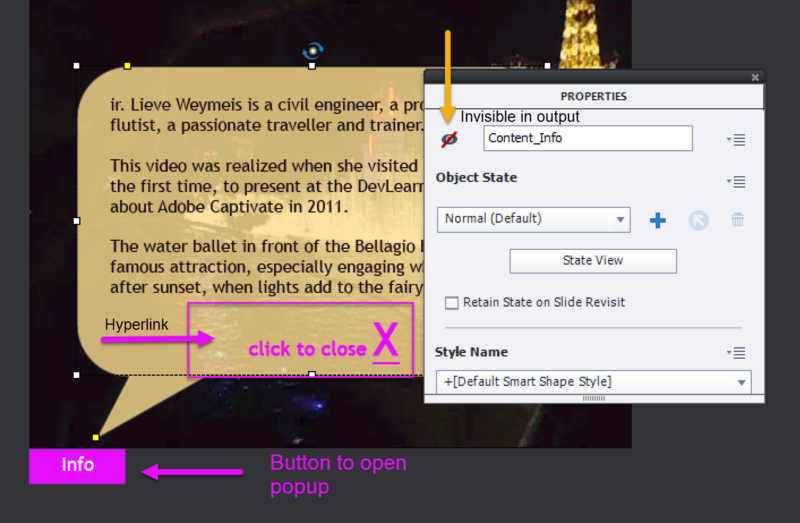 To facilitate editing, it can be useful to hide some objects using this first Eye button. This screenshot, taken from the game explained in 'Using the While loop' shows several hidden (on stage) objects and even a group. 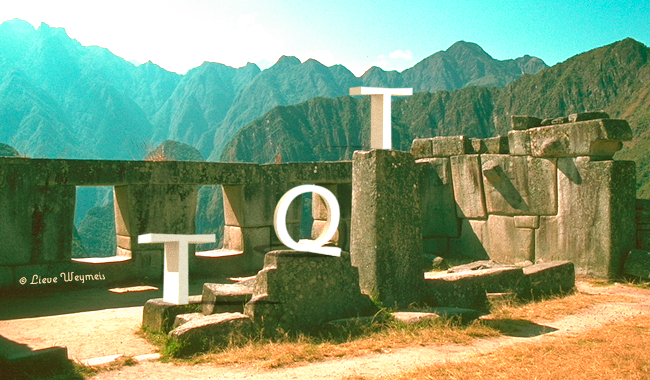 Since the topmost group still has one visible object (click box), its bounding box is visible on the stage. For the other group even the bounding box has disappeared. There is one exception: you can also click the radio button left of the slide timeline. In that case the slide will be hidden (with all its content) and it will not appear when previewing/publishing. 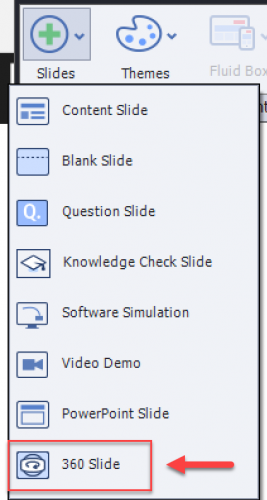 It is an alternative work flow for using the right click menu on slide(s) in the Filmstrip, option 'Hide Slide'. With both work flows you'll see a dimmed slide in the Filmstrip and an eye icon (not a button) as indicator. 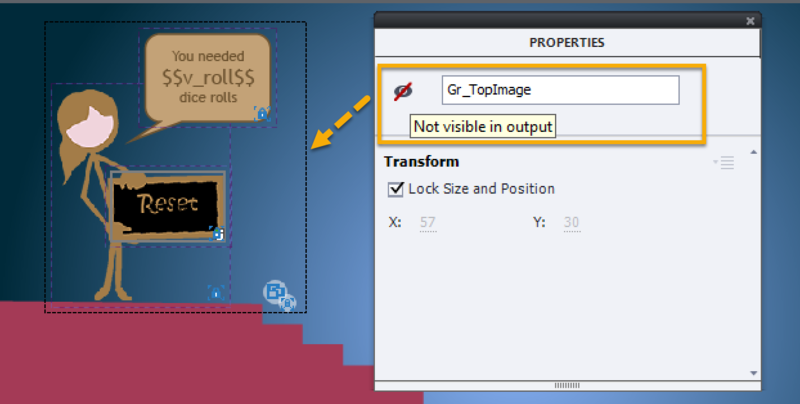 If you want an object to be initially invisible in the published course, you need to click this button in the Properties panel (inspector) of that object, top left. It is almost the opposite button of the first because the object will not disappear on the stage at all. Why would you hide an object in a published course? Maybe because you'll want to make it visible later on. Example: you want to allow navigation to the Next slide only after certain actions have been performed by the learner (like clicking hotspots, or entering text in fields). 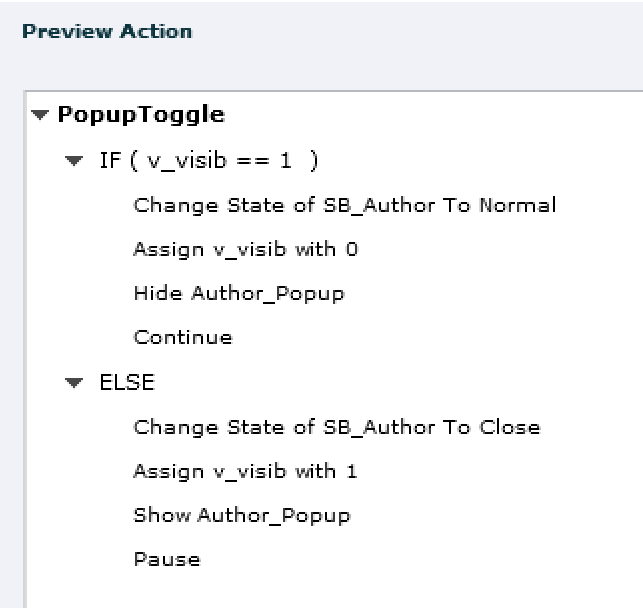 Showing an object will be done with the command 'Show'. 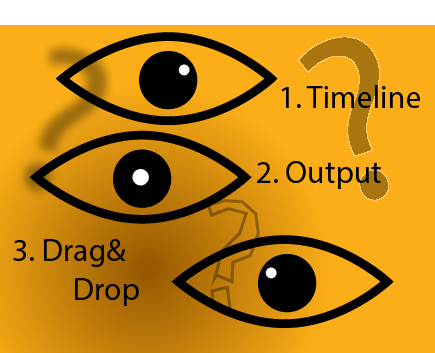 Making an object invisible by using this second Eye button can also be done on runtime by the action 'Hide' and that is often a better approach. Since you can show a hidden object, it means that the object is included in the published version which is not the case with a hidden slide. 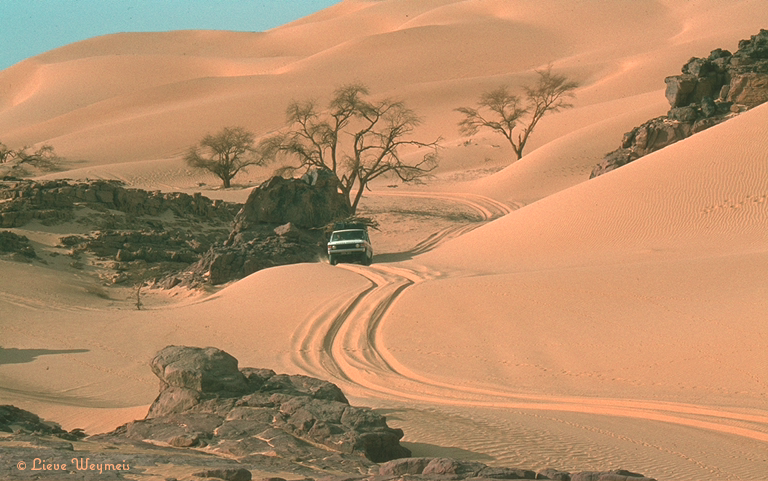 A hidden slide is not included in the published course. 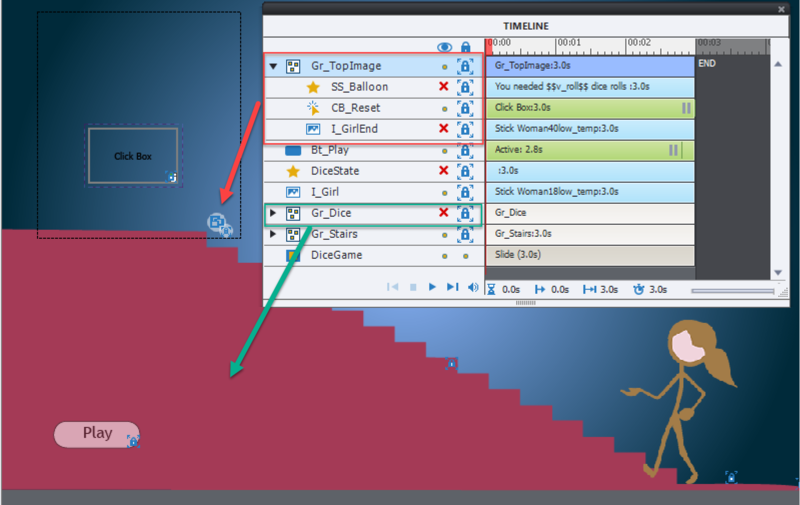 For those reasons I suspect it is Time to update that old article, to explain the ins and outs of the Timeline panel with its latest additions like CPVC-projects and slides, Effect Timelines, Drag&Drop. Timeline panel, in collaboration with the Timing Properties panel is at the core of the Captivate applications. Personally I'm persuaded that it should be a top priority in the skillset of any Captivate developer, whatever its level. Since I cannot offer you a 'digestive' (limoncello, grappa, schnapps, single malt;;;) I will split up this (broad) subject in several articles. You are reading the introduction. Following posts will treat topics like 'Timeline in a cpvc-project', 'Timelines in a cptx-project, master slides and normal slides', 'Color coding and Shortcut keys for Timelines', 'Why/how to pause a timeline?'. 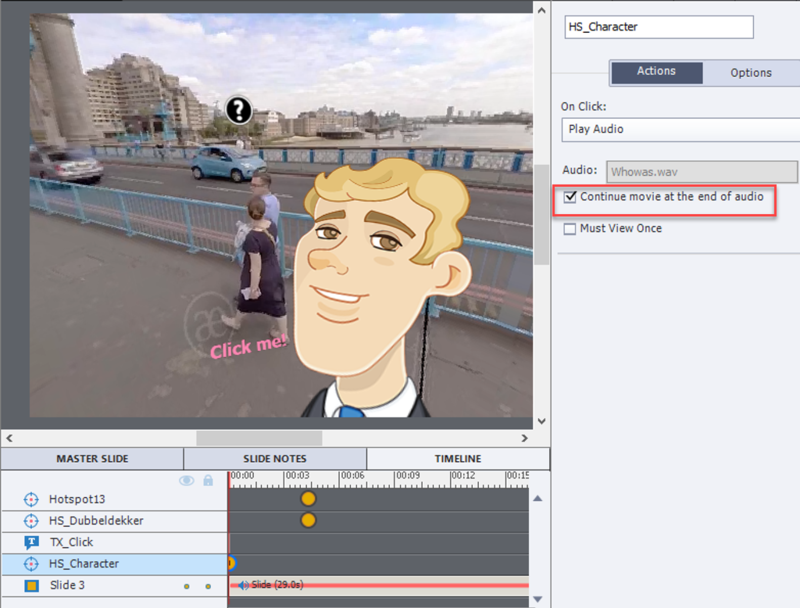 Many users talk about the output of a Captivate project as 'a movie'. Although this is only completely true for a file published to a video format (MP4), this indicates well that Captivate is related to video applications like Premiere Pro and After Effects. No one will have doubts about the importance of 'time' for video. A movie has a playhead, which moves at a certain speed. That speed is usually indicated by the term 'frames per second', or FPS. Captivate has two types of 'raw' files: the cptx-files (slide-based) and the cpvc-files (less-known, Video Demo files). Both types have a Timeline panel but with some differences as I will try to explain in this sequence of posts. Let us start with those features that can be found always in the Timeline. The Playhead is represented by a red rectangle. When you use the play button in the control panel (see 4), you'll see its movements. You can also drag the Playhead to a certain position on the timeline. The size of the rectangle is bit different between a cptx and a cpvc project as you can see in the screenshot. When clicking the Eye button on top of the column, all objects in all tracks will be hidden on the stage. 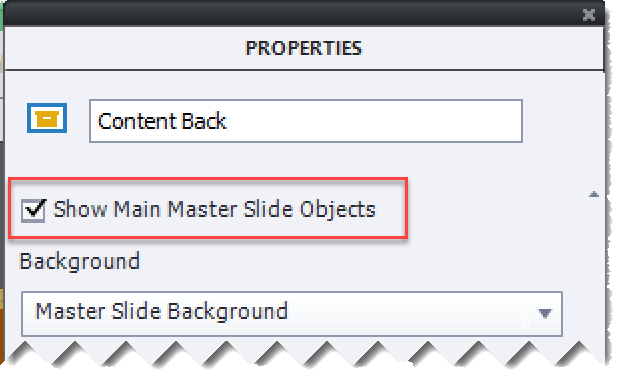 This is only meant for editing reasons, it will not affect the published course.To hide items after publishing you need to click that 'other' Eye button in the Properties panel of the objects (hidden in Output). When clicking on a dot under the Eye button, next to a track, all objects on that track will be hidden. In the exampled on the screenshot, the second tracks from the top have been hidden. Next to the Eye button is a Lock button, also with dots next to each track. When you click the button itself all objects on all tracks will be locked: not available for selection nor for editing properties. However, if you click a dot next to a track, there are two states. On the first click only size and position will be locked. 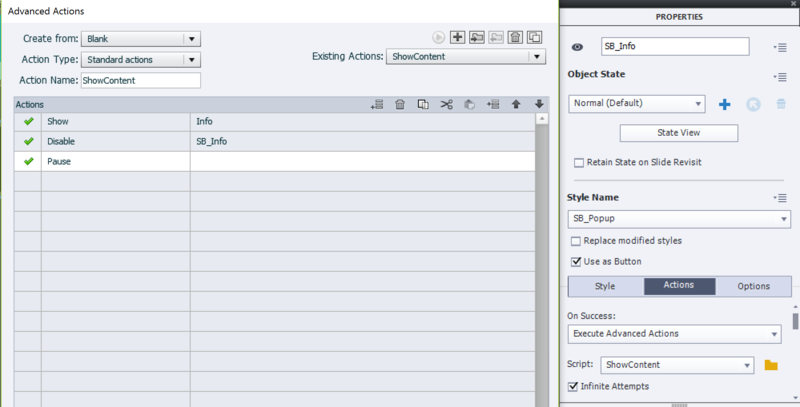 In that state you can still select /style the objects. The blue Lock icon is surrounded by 4 arrows, as you can see in the screenshot: for the cpvc it is the track immediately above the Video/Audio track, for the cptx project the uppermost timeline. Clicking twice on a dot results in full lock: no selecting/editing is possible. 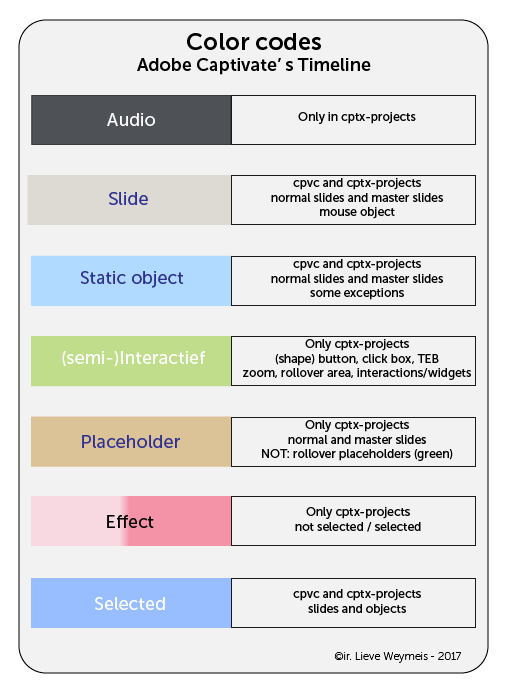 This is the case for the uppermost Objects track in the cpvc-screenshot and for the image I_topics in the cptx project. Watch the different look of the lock icons. The Control panel at the bottom of the first column (see screenshot above) has the classical (video) buttons: 'Move Playhead to start', 'Stop', 'Play', 'Move Playhead to the end'. Play and Stop can also be activated with the space bar if the timeline panel is active. Warning: Play Slide under the button Preview has the same function as Play in this control panel. Although it is under the Preview button it is NOT a preview at all! It is just meant to be used for editing, will not show how the slide will look after publishing. This is a common misunderstanding. 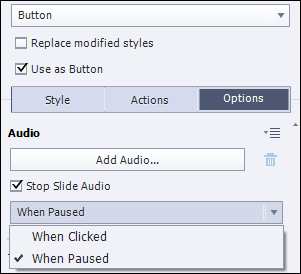 The last button on the control panel: 'Audio' is a toggle, will mute/unmute Audio when watching using the Play button. Like the Eye button, this will not affect audio when publishing. 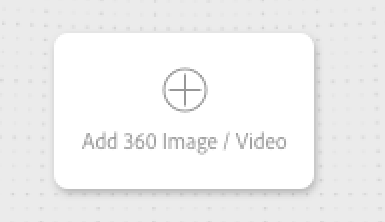 The state of this button will apply to all open projects. Hourglass icon: indicates the location of the playhead from the start of the track; its tooltip is 'Elapsed Time'; this indicator is always available, even when no track nor object is selected. 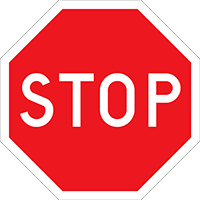 Vertical line + right arrow (Selected Start Time) will only have a value when a video clip or a static object is selected; it will indicate the start time of the selected video/object. In the screenshot the Smartshape on top is selected. Vertical line + right arrow + vertical line (Selected duration) will show the duration of the selected clip/object, is only available when a video/object is selected on a track. The next article will be about the specific features of the Video Demo timeline (cpvc-project) and the cpvc-slides. You'll not have to wait long, neither for the third article about the specificity of timelines in a cptx-project (master slides and normal slides).